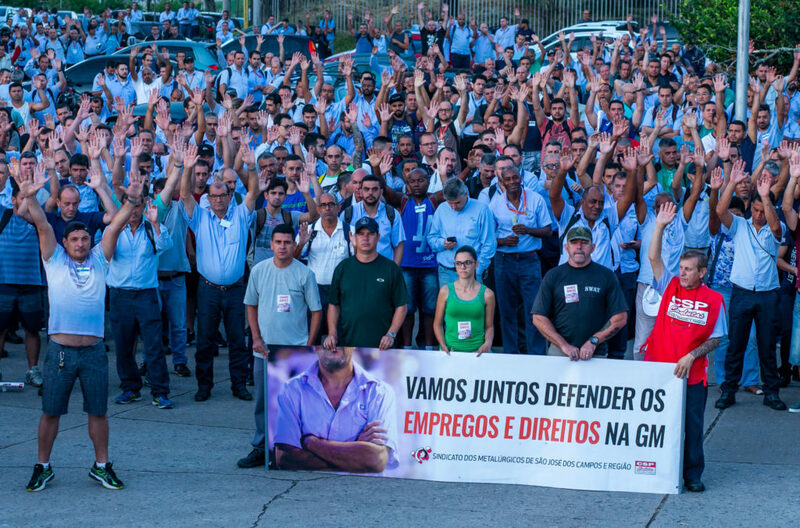 Last Friday, February 1, 2019, workers at the GM plant in São José dos Campos, Brazil took a militant step forward in their fight against GM’s threats and demands for concessions. Their union, Sindicato dos Metalúrgicos (Metal Workers’ Union), held a meeting to discuss GM’s demands, but it was no ordinary meeting. They held the meeting RIGHT AT THE PLANT GATES, complete with a sound truck. Production was shut down while workers took part in this mass meeting – and it delayed the start of production for 90 minutes. The workers heard that GM is threatening to close plants in Brazil unless they get 28 major concessions, including a wage freeze, unrestricted outsourcing and the end of job protection for injured workers. In the end, the workers voted to soundly repudiate GM’s blackmail, and vowed to continue the struggle. 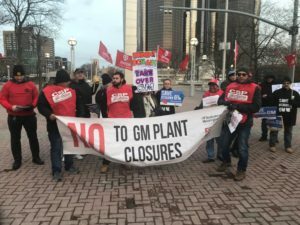 Brazilian autoworkers join US and Canadian protestors against GM plant closings at the Detroit International Auto Show, January 18, 2019. Following the plant-gate mass assembly, a meeting was held by union representatives of Brasil Metalúrgico. Brasil Metalúrgico (Brazil Metalworking) is a common front representing all metalworking unions and federations in Brazil, to discuss joint actions in defense of jobs and rights for workers throughout the automotive sector. The union’s commitment to international solidarity is evident in the fact that four representatives from the Sindicato dos Metalúrgicos (Metal Workers’ Union) had traveled to Detroit for the rally held on January 18 by Autoworkers Caravan and the Detroit Democratic Socialists of America, calling for seizing GM’s plants and converting them to useful production, as part of the call for a Green New Deal. That exciting rally at the Detroit International Auto Show also included Canadian GM workers and retirees from Unifor Local 222. The Sindicato dos Metalúrgicos is calling for international solidarity against GM and for joint actions by autoworkers and their unions in Brazil, Canada, Mexico and the US. The Central was born by adding youth and anti-oppression organizations that were prepared to unite under the banner of a common program for the protection of the interests of the working class against capitalist exploitation and oppression. The new entity includes the Anel (National Assembly of Free Students), the Women in Struggle Movement, the Quilombo Race and Class Movement, among others. This is an innovative experience in organizing our class in Brazil. Unite, in a single national entity, the trade union movements, popular, youth and the fight against the oppression of women, blacks, homosexuals and other segments. CSP-Conlutas guides its actions in defense of the immediate demands and historical interests of the working class, aiming at the end of all forms of exploitation and oppression. Our struggle has the goal of achieving the conditions and building a socialist society, governed by the workers themselves. The principles of CSP-Conlutas include autonomy and independence from governments, building unity as a strategic value in the struggle of the workers, direct action, collective mobilization of our class, and active internationalism. Is Unifor’s Leadership Ignoring the Need for International Solidarity? Militant actions by auto workers in Brazil. A strike by tens of thousands of auto workers in Mexico. The rally in Detroit January 18 that challenged the absolute right of corporations to wreak destruction on workers and communities. On November 21, 2018 there was a general strike against the South Korean government demanding reform of labour laws, and a curb to the power of industrial conglomerates (known as chaebols in Korea). It was joined by more than 125,000 members of the Korean Metal Workers Union at 109 KMWU workplaces. The striking workers call for the chaebol-controlled economic system to be dismantled and replaced with economic democracy, and for a reform to labour law that guarantees all workers internationally-recognized, fundamental trade union rights: to join a union; to bargain collectively; and to take collective action … Auto workers at Hyundai Motors, Kia Motor, General Motors (GM), shipyard workers at Hyundai Heavy Industries, Daewoo Shipbuilding and Marine, and auto parts workers at Hyundai Mobis and other major components workers went on strike for four hours or more. And yet, even though the struggle of auto workers seems to be ramping up from Mexico to Korea, we have heard nothing about it from the Unifor leadership. We need to be building unity with auto workers in Mexico, but the Unifor leadership is calling for a boycott of vehicles built in Mexico – which only damages that unity. We need to be taking militant action like the strikers in Matamoros, Mexico and Korea. We need to be showing the power of workers in the factory, like our sisters and brothers in Brazil. We should be organizing coordinated actions and mutual support with autoworkers around the world. Instead, Jerry Dias and his inner circle are investing their time, and our money, on an expensive PR firm to design and air Super Bowl ads. We need to stop being spectators, and start being the main show. Workers have power if we dare to exercise it. Let’s start by supporting the workers in Brazil in their struggle wherever we can – in our Local Unions and Labour Councils, and calling on our National Union to do the same.